While traditional RF-based comm systems struggle to meet these demands, an emerging technology, free-space optical lasercom, can address all these areas. Figure 1 shows the concept, with cubesat lasercom terminals. A relatively modern RF SATCOM link operates in the Ka-band, at an RF carrier frequency of about 30 GHz. A free-space optical lasercom link uses light, instead of RF energy, to carry data. A typical lasercom link operates at a carrier wavelength of 1.5 microns, or a carrier frequency of about 193 THz — that’s 6,400 times higher than the RF link. For a given aperture size and link range, the lasercom beam spreads 6,400 times less than the RF link, meaning that a much higher fraction of the transmitted power is received. The transmit light is literally laser-focused on the receiver. In practice, this means that lasercom links operate with much lower transmit powers, with much smaller apertures, and at much higher data rates, than RF links. There are other advantages of operating at higher frequencies. For one, the bandwidth available for transmission is much greater. A Ka-band link might have 1 GHz of bandwidth allocated, but the bandwidth available for lasercom, largely determined by the bandwidth where good amplifiers can be made, is almost 8000 GHz. The need for bandwidth-efficient modulation is greatly reduced, leading to lower requirements for signal-to-noise. Furthermore, free space lasercom technology leverages the very large technology base of commercial optical fiber communication systems, where, for example, coherent modems handling 100 Gigabits/s/carrier are readily available for about $25K. Because beam spreading is reduced, the problem of different users interfering with each other is greatly reduced. This leads to another advantage of lasercom: all this optical spectrum is unlicensed and available at no charge. 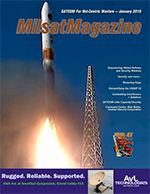 As demands for government users to migrate RF spectrum to civilian users grows, many missions dependent on SATCOM need to be looking to migrate to lasercom. Security and anti-jamming is one more critical advantage of lasercom. An eavesdropper can’t detect a signal unless he’s inside the beam. Similarly, a jammer can’t effectively jam a receiver unless he’s inside the field-of-view of the receiver. Both the transmitted beam spot size and the receiver field-of-view are reduced over RF systems by the roughly 6400x ratio of the carrier frequencies. For example, even if an RF aperture can be 10 times larger diameter than an optical aperture, the footprint of the optical beam on earth is 600 times smaller. Of course, lasercom has its limitations and challenges. Space/ground applications are limited by the need to operate in the absence of clouds. This can be met by a diversity of ground sites, or by an airborne relay operating above the weather. Space and space applications of lasercom are not impacted by clouds. Even though transmit power is much lower in optical than RF systems, High Power Optical Amplifiers (HPOAs) that can generate the 10 to 20 W needed for high-end lasercom systems have, until recently, been considered risky. Plus, with few lasercom-in-space systems fielded, the technical risk for lasercom is perceived to be higher than for RF. Much progress has been made reducing these perceived risks. An example of an enabling component for lasercom is shown in Figure 2 — engineers from LGS Innovations ready an HPOA for successful thermal-vac testing. These amplifiers are constructed with optical and opto-electronic components that have been extensively tested for long-duration space missions. In a test, one unit ran open-loop at full power for 5-½ years with no signs of degradation. The units are at TRL 6 for space. To support flexibility in terminal design, both Polarization-Indefinite (PI) and Polarization-Maintaining (PM) units have been demonstrated, with excellent efficiency1. Confidence in lasercom for space applications has been boosted by successful demonstrations from the U.S., Europe, Japan, and China. For example, NASA recently returned 622 Mb/s from lunar orbit to the Earth in the Lunar Laser Communications Demonstration (LLCD)3. 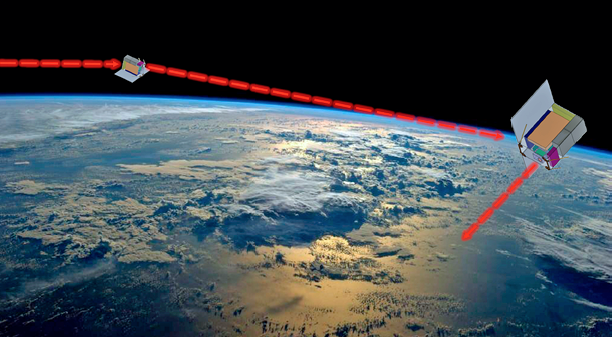 NASA is planning a ground/GEO/ground lasercom demo (Laser Communications Relay Demo, LCRD), with launch scheduled for 20194, as well as lasercom demos from LEO to GEO and from deep space. Figure 2. 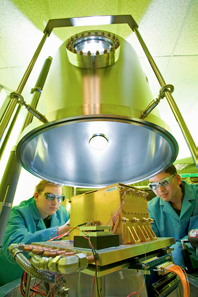 LGS Innovations engineers prepare a High Power Optical Amplifier for thermal vacuum testing. Image is courtgesy of LGS Innovations. While most lasercom terminals to date have been relatively heavy and designed to go on large vehicles, an emerging application for lasercom is on smallsats. For example, LGS Innovations is working on a DARPA program to build LEO-to-LEO lasercom terminals with a gimbal for independence from satellite body-pointing. This program has design targets of <2 lbs. total weight and orbit-averaged bus power draw of <3 W. Global, low-latency communication networks can be constructed with a LEO constellation using many of these relatively low-cost links. Terminals like this can also be adapted for high-speed LEO-to-ground links. 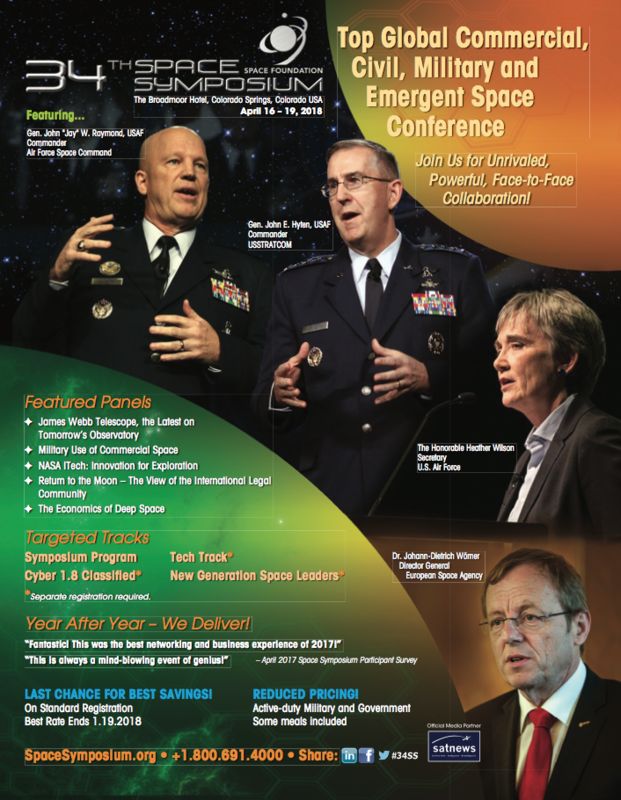 To deliver high-bandwidth comm to the warfighter, while keeping costs in check and providing higher security and anti-jam protection, it’s clear that lasercom will become a part of future MILSATCOM networks.